Traditional photovoltaics rely on an asymmetry in electronic structure or electronic carrier type for selective carrier collection and the conversion of solar radiation into electricity. We are exploring the use of an asymmetry in ionic content in mixed ionic/electronic conducting polymers as a means for generating a photovoltaic effect. 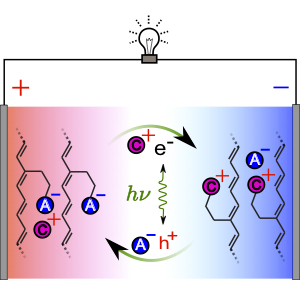 The asymmetry in ionic content also leads to redox chemistry making possible new hybrid battery/photovoltaic concepts for both energy conversion and storage. Students working on this project will be involved in the synthesis of ionically functionalized conjugated polymers and their detailed electrochemical characterization. They will also be involved in the fabrication of multilayer polymer structures and their structural and electrochemical characterization. A primary goal will be the fundamental understanding of mixed ionic/electronic conducting interfaces that use sunlight to directly drive redox disproportionation as a means of energy storage.